Paul Beckwith is one of the many scientists I’ve been following in the ongoing discussion about warming and the probability of a sixth great extinction event. This is worth your time– the heating on this year’s El Nino event already exceeds the record heating from the 1998 event. Check out his videos as well. I am back, after a long video hiatus. I have been chomping at the bit to film, but held off to essentially finish this website. Like many projects that start out small, they can become nonlinear like the climate. My web/coach/guru/Yoda in this project was the wonderful David Korn. I cannot thank David enough. Please see my many recent updates, including amply increased and revised Solutions tab, Musings (and Insights), Curriculum Vitae, Basic Chronology, Humor, Movies, Movies, Movies, and just today, Books. Some are large additions. Please consider helping with a donation (far right on task bar) if you are able to. Every little bit truly helps and is very deeply appreciated. 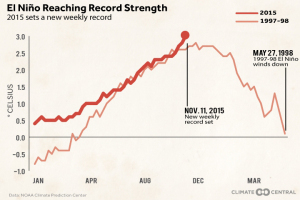 One Graph Shows El Niño’s New Record, from Climate Central.